Looking for Firefox or Thunderbird? You'll find them and a whole lot more at Mozilla.com. 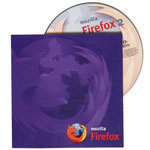 Get Firefox on CD, t-shirts, and more at the new Mozilla Store. content available under a Creative Commons license | Details.